A luxurious filet, wrapped in a thick slice of farmhouse bacon, makes for a delicious, tender steak. 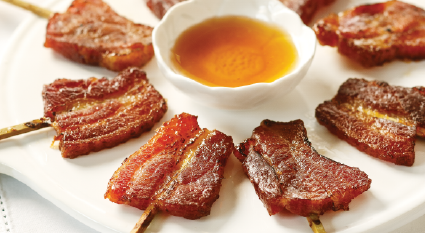 The smoky bacon adds an element of richness that takes the beef flavor to new heights. A classic pairing made with the highest quality product. It doesn't get any more gourmet. Four 6 oz. filets.